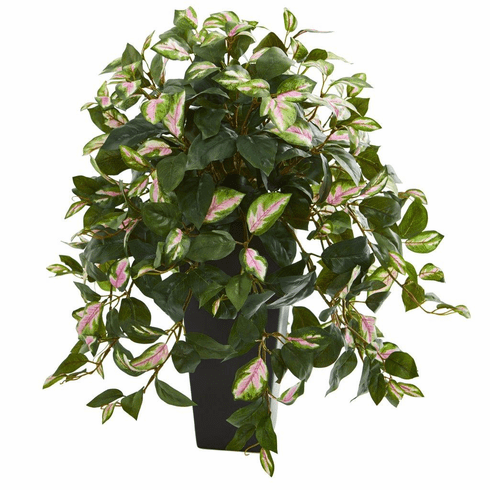 This hoya artificial plant features pink-tinted green leaves that seem to keep on growing as they gently escape out of the included simple black planter. With its lifelike appearance, this 27-inch ornament will bring life to your space. Set this on a rectangular side table and settle a small metal sculpture beside it for a sleek finish. You can also tuck this in a place where the light gently hits to accentuate this ornament's natural green color. Height: 27 In., Width: 16 In., Depth: 16 In., Color: , Pot Size: H: 13 In. W: 6 In. D: 6 In.